FERC is required to have public hearings on the Draft Environmental Impact Statement (DEIS) released for construction of the Mountain Valley Pipeline. But these were not your father’s public hearings. Instead of an open meeting, with speakers seen and heard by everyone including the media, FERC mandated a shrouded procedure where anyone who wanted to comment picked a number, waited in a large room, and then testified alone to a FERC official and a bored stenographer. We will have more on this later. In addition to conducting their “public” hearing in secret, the FERC imposed strange rules that were enforced in the large waiting room at the Sheraton Roanoke Hotel and Conference Center near the airport. People gave their private testimony in Turin Salons B or C (#2 in red on map). 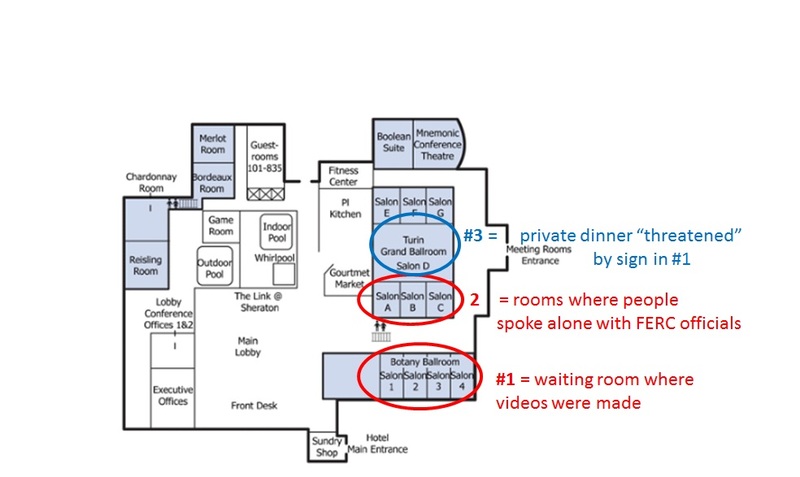 They waited in Salons 1-4 of the Botany Ballroom (#1 on map – in red on bottom). An unrelated dinner was going on in the Turin Grand Ballroom (#3 on the map – in blue on top). POLICE ACTION PART 1 (click to see entire video). A woman in the waiting room was quietly holding up a small handmade sign that asked, “Who owns FERC?” She was approached by a man in a red shirt with no uniform or badge (apparently an undercover FERC operative), who told her that she could not hold up the sign. 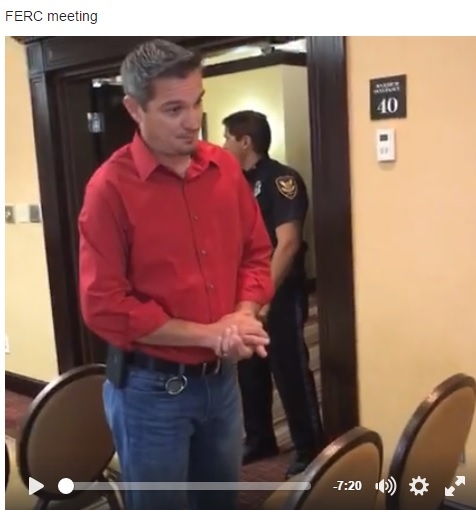 After being asked who he represented, he stared at the camera and said he had not given permission to be videotaped (as if he were NOT acting for a federal agency in what was supposed to be a public hearing). He eventually produced an ID and gave his name (this may not be exact) as Jerrod Linman. He later returned with a two-page list of rules from FERC for this meeting, pointing to a statement that no signs for or against the pipeline could be displayed. When the woman peacefully declined to leave, Linman called in local police (not clear whether they were working for the hotel or local government) and a hotel official. POLICE ACTION PART 2 (click to see entire video). 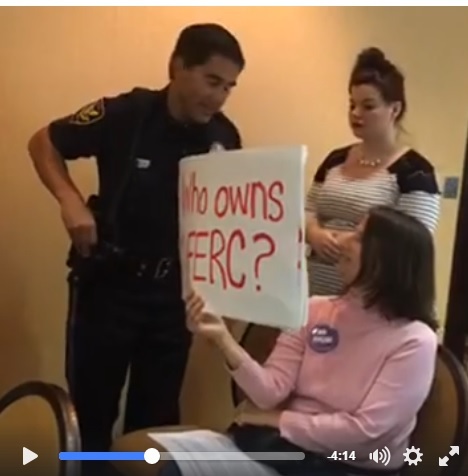 Both the police and the hotel official tell this citizen that the FERC public hearing is a PRIVATE meeting (although they also admit it is a public meeting) and that she is disrupting the meeting by silently holding up a small sign. At about 2:38, the hotel official states that she must “protect” a private dinner going on in a ballroom down the hall – which seems pretty astonishing. A person from the dinner would have to walk out of the ballroom, cross a hallway, enter the waiting room and look around to even see this sign. And the police do in fact compel the woman to leave – though they tell her they are not going to drag her out of the room. Whose police are these and why are they treating a quiet citizen this way? Oh, and who does own FERC? There is some good news. Virginia Tech students appeared in the waiting room later in the evening and periodically sang and chanted with a very large sign until escorted out by police. Their high spirits contributed to unity and positive feelings among the large number of people who turned out to express their opposition to this unnecessary and destructive project.